I can't tell you what torture this has been. 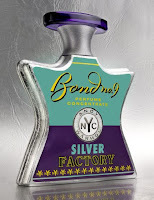 In the interest of full disclosure, I received my sample of Silver Factory from the very kind people at Bond No. 9--this past August, when I received samples of Saks for Her and Saks for Him. Don't think I am bragging, for I never, ever receive samples from perfumers, and I was so unbelievably thrilled. For just one moment, I didn't feel like a dinky blogging perfume buffoon. I felt like part of the party. I share this not only to be on the up-and-up, but also because in a sense, I suppose that's what The Factory was all about: the flash in the pan, the fifteen minutes of fame, the cult and culture of pop art and real music. That moment in life when the most magnetic person in the room has turned to face us, and for that moment we are also magnetic and full of possibility. Is it possible to feel nostalgia for a time before one's birth? (Although not much before) I spent much of Thanksgiving afternoon watching Pennebaker's Don't Look Back about Bob Dylan's tour of Britain in 1965. We started discussing Edie Sedgwick, and what songs Dylan may or may not have written about her ("Leopard-Skin Pill-Box Hat"? "Like a Rolling Stone"? Is Warhol the diplomat on the chrome horse?). I got lost in the film as though I were watching something recorded from my own past that I had forgotten. Something about that time mesmerizes me, but in truth, I was never all that interested in Andy Warhol or his art (although I will forever be thankful for Lou Reed and The Velvet Underground, and Nico). Still, he was, as they say, before his time, postmodern when modern was still around. That he himself is an icon, that he at least surrounded himself with artists, cannot be denied. So many magnets on one room: where does one turn to look? Here's the thing about Silver Factory: Even knowing the most general history surrounding Andy Warhol, I believe I would have expected something more unusual, or even jarring. Something cultish like POTL, or the love-it/hate-it, oft-copied Angel. Instead, Silver Factory, with top notes of incense, wood resin, and amber; a heart of jasmine, iris, and violet; and a base of cedarwood, is a beautifully restrained fragrance, and for all the woods and incense, it's not the least bit warm. It's an iris carved into highly-polished granite, a house in a snowstorm where the fire's gone out but the smoke still lingers in dry, still air, offering the promise of but not delivering warmth. I don't at all imagine The Factory with lights and mirrors, but in the light of a cold winter day, empty, its high windows framing a chalky sky. It makes me as nostalgic as the Pennebaker film did, as though I arrived too late for the party. History's already been made and has left this scent in its wake.